Anchored onto dental implants that hold it in place, a removable overdenture replaces all your teeth and feels totally secure in your mouth. 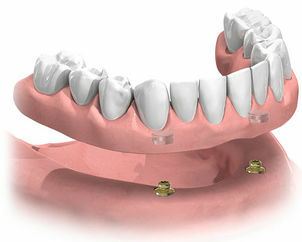 Unlike standard dentures, dentures secured by implants won’t move while chewing or laughing therefore the discomfort associated with loose or ill-fitting dentures is removed. This option enables you to remove and clean the dentures yourself.